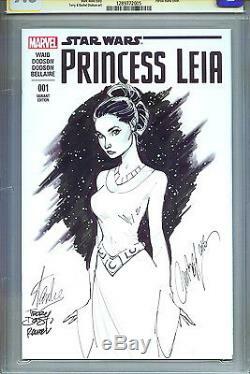 This Star Wars Princess Leia #1 features an original art sketch of Leia with star field background by fan-favorite illustrator J. It is also signed by not only Stan Lee but both Terry and Rachel Dodson as well. It is professionally graded and certified by CGC as part of their special Signature Series. With Signature Series books a certified witness, employed by CGC, actually observes the signing/sketching of the comic and then immediately takes possession of the book so there is no possibility of the real autograph/drawing being switched out with another. Case is scratch and defect free. REGARDING CGC CASES: CGC is an independent, third-party grading service that grades and then encapsulates comic books. This encapsulation process has potential inherent results. These include, but are not limited to, either the left, right, or both sides of the outer case not being sealed completely, an appearance of waviness, or the existence of Newtons Rings (an interference pattern created by the reflection of light between two surfaces) that can appear and are frequently mistaken for moisture or oil inside the case (in actuality, this effect is between the inner softer plastic shell and the outer, hard plastic shell and are not on the book itself). These and other results can occur during the encapsulation process. These effects, however, do not in any way affect the book itself or its designated grade. As the CGC book is tightly encapsulated inside the soft plastic case, this will not result in damage to the book. If you are sensitive to any of the above outlined issues regarding CGC cases poorly sealed sides, Newtons Rings, general imperfections in the plastic case, slight movement of the interior soft-plastic case inside the outer shell, etc. Please inquire for full details. We package items extremely securely. We apologize for any inconvenience and appreciate your understanding. Your government may impose upon you before they will release the package to you. In order to stay ahead of the collectables market curve and offer the security and piece of mind that a mere paper COA does not and cannot provide, empire. Auctions offers certification through Collectors Proof. As always, all autographed items I sell were personally witnessed - by myself - being signed by the artist, writer, creator or celebrity in question. Further, art sketches - and most published pieces of original artwork I sell - were obtained directly from the artists themselves. Not only is this a record of the guarantee of the authenticity of the item, traceable back to its original source, but it also maintains a permanent web-based record of ownership accessible from any computer with internet access. It also allows the current owner to print out a hardcopy of a Certificate of Authenticity (COA), if desired, but without the need of actually having to protect physical paper certificates from loss or possible destruction as the documentation is permanently maintained and available online. Please note- the guarantee that I sell only signatures I personally witnessed the signer in question autograph is real regardless of whether or not you opt for the authentication service through Collectors Proof. 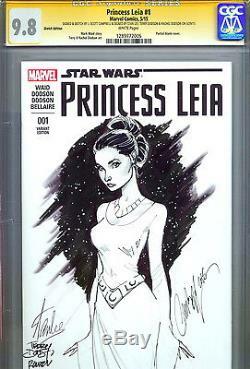 The item "CGC SS 9.8 Signed Star Wars Leia 1 J Scott Campbell Original Art Sketch Stan Lee" is in sale since Wednesday, June 01, 2016. This item is in the category "Collectibles\Comics\Modern Age (1992-Now)\Superhero\Star Wars".